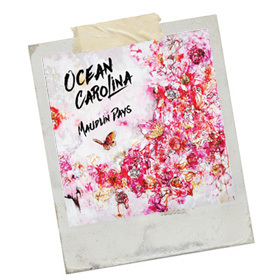 This is Ocean Carolina’s second album; a collective that revolves around the central figure of wordsmith and singer-extraordinare Michael Simone and wears its influences proudly on its collective arm. During a lifetime in the music business travelling the world, Simone has embraced all kinds of music from Southern Rock Funk, British Goth (the Cure & Cocteau Twins) and possibly most important of all, Dame Morrissey of Salford. When you stir all of those ingredients together you achieve an album that is 100% Ocean Carolina but of a Country-Rock vintage. The jangly guitar that opens opening track All I Can Do immediately caught my attention; then Simone’s slightly tortured and weary voice made me listen to his words quite intently. Then the melody certainly reeled me in; and a good story is very well told gently easing us in to the web. It’s no great surprise to find most of the songs are about relationships that generally have an unhappy ending; but Simone’s way with words avoids the cliché’s and stereotypes that I have to listen to on a regular basis. Just when you think you know where Ocean Carolina are going they through a curve ball with Cry Baby Cry which has a Soulful thread weaving through it via the bass lines. Crazily the singer’s voice enters Scott Walker territory (or Marc Almond for younger readers) and it evolves into the first ‘Torch’ Alt. Country song I’ve ever heard; and it works on every level. Half way through the album we casually stumble on the brittle acoustic opening of Nobody Wants to Cry and the bass cuts through it again, like a rusty knife leaving me slightly unnerved; but pressing replay to hear it all over again. Shortly afterwards the band ease into a Country shuffle with Don’t Carry On as the guitarist goes all Vince Gill on a song that both Ryan Adams and Gill himself would be proud to have penned. Maudlin Days ends with the beautifully mournful Someday Soon that showcases all that is good about this record from the various musicians to the song itself. Producer Jon Graboff (Ryan Adams and the Cardinals!) has done an exceptional job here; teasing out tiny nuances within an overall ‘big landscape of a sound’ and allowing the singer to actually sing his songs without fear of getting lost in the mix. Don’t worry about my reference points in this review; they will all make sense when you hear the finished article as all the constituent parts make for a wonderful album.